Suzuki will have almost quadrupled its fleet sales this year, having put a team and strategy together to support it, and that’s despite a very limited diesel offer, according to director of automobile, Dale Wyatt. 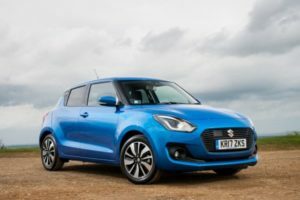 The latest Suzuki Swift brings mild hybrid technology. Under the guidance of Graeme Jenkins, appointed head of fleet at the start of this year, and supported by a team coming into place over the course of 2017, the company has been working with dealers and leasing companies to find new opportunities, particularly among SMEs. Volumes have grown from 2,500 to a predicted 9,000 units, which is almost a quarter of Suzuki’s 40,000 anticipated UK sales in 2017. The growth in fleet – a new focus for the brand – hasn’t come as a result of broadening its diesel offer though. The new Swift is petrol only, and the only diesel cars Suzuki sells are the S-Cross and Vitara crossovers. Instead, the brand has put its efforts into efficient petrol engines and a widening mild hybrid offer, with further plans to electrify the range over the next few years. Around 97% of its UK sales volume is petrol powered. “Attitudes are changing. There was a time where not having a diesel offering was a problem in fleet, but not now,” said Wyatt.For more of the latest industry news, click here.